1 Augite-diorite of Camphouse, and Faskadale Bay - Section A. 2 Augite-diorite of Camphouse, and Faskadale Bay - Section B. 2.1 Locality 1 [NM 498 707]. 2.2 Locality 2 [NM 498 708]. 2.3 Locality 3 [NM 497 711]. 2.4 Locality 4 [NM 497 711]. 2.5 Locality 5 [NM 491 711]. Augite-diorite of Camphouse, and Faskadale Bay - Section A. The excursion examines a small intrusion with spectacular mineralogy situated about 3 km from Kilchoan and involving about 2 km of walking over boggy ground with some streams to cross. Excellent views of the western side of Ben Hiant are also seen during the walk. Cars should be parked at [NM 511 642] just before the bend on the main Kilchoan-Salen road. At this road bend is a concrete pit for silage storage and the track runs from there down to a bridge crossing the Alit Choire Mhuilinn stream. Below the bridge Moine schists are found with frequent cross­cutting cone-sheets, the latter exhibiting chilled margins. The track bends north and goes round a field with occasional knolls marking the sites of cone-sheets. Thereafter a series of sheep pens is reached and the track bends round these until at the far side it divides, the northern branch being taken. The track runs over limestones of Lower Jurassic age (Broadford Beds) often preserved in the vicinity of cone­sheets where baking has occurred. Finally, the track is crossed by a deer fence with a gate in it. The augite-diorite "boss" occurs about 100 m north of this gate on the west side of the fence being marked by about ten isolated small exposures of black rock. Inspection shows variable grain size from coarse to pegmatitic with augites occasionally visible some 10-20 mm long. Although the form of the intrusion is difficult to ascertain, it appears dome-shaped from the local topography, but its age relationships with the Centre 1 intrusions are unknown. 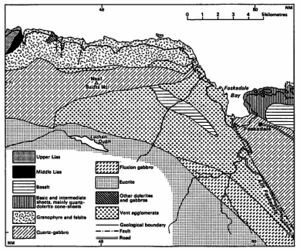 Augite-diorite of Camphouse, and Faskadale Bay - Section B.
Geology of Faskadale Bay (after Richey, map 19). Minor intrusions removed. 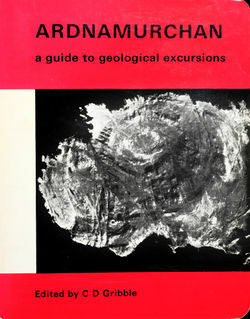 The object of this excursion is to examine rock types of Centre 1 in north Ardnamurchan which were not seen in the Ben Hiant excursion, particularly vent agglomerates with plentiful xenoliths, gabbros and granophyres. Total distance (Kilchoan-Kilchoan) 31 km, of which only 2 km are by foot. About 7 km eastwards from Kilchoan, the north (left­hand) fork of the road is taken to Faskadale (and Achateny) and about 3 to 4 km along this north road the left-hand fork is again taken to Faskadale. Cars are parked on flat land just before farm buildings at [NM 501 707] Low tide is preferred for this section. Locality 1 [NM 498 707]. The track leads westwards from the farm at Faskadale to the pebble beach which is crossed towards the mouth of the Allt Faskadale stream, which enters Faskadale Bay about 250 m from Faskadale farm. The shallow Allt Faskadale can usually be crossed here fairly easily (although a small footbridge occurs about 150 m upstream), and the outcrop of rocks examined. These represent a sheet of basic rocks dipping to the north-east at 30°. From the coloured map the major north-south trending (Alit Faskadale) fault enters Faskadale Bay here, and it may be that these rocks represent a cone-sheet which has had its attitude disturbed by this fault. Locality 2 [NM 498 708]. From the mouth of the Allt Faskadale the shoreline of Faskadale Bay is followed round to the west and north until a large shelf of agglomerate. well displayed at low tide, is reached. The agglomerate is considered to be an early intrusion of Centre 1 age and contains angular fragments of Moine schists, spherulitic rhyolites and dacites, basic dolerites and lava flows. It is of importance to note that no rhyolite or dacite lavas have been observed in Ardnamurchan, so that these fragments either repre~ent parts of a totally eroded acid lava cover or pieces from an acid magma which crystallised in the original volcanic vent and which was disrupted at a time just prior to the formation of the vent agglomerates. 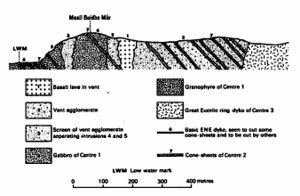 Within this agglomerate north-west to south-east trending cone-sheets (dipping south-west at 40°) and north­south trending vertical dykes are observed. Both of these narrow intrusive types are basic in composition. Locality 3 [NM 497 711]. Continue along the coast for about 300 m to the north-west and a vertical "wall" of quartz-gabbro representing the old gabbro west of Faskadale can be observed intruding the agglomerate. At this place the gabbro is about 20 m wide and has the appearance of a porphyritic dolerite. However, the porphyritic rock is usually a marginal facies developed particularly along the east-west northern edge of the quartz-gabbro and grades into normal quartz-gabbro to the south. The fine-grained porphyritic gabbro is chilled against the agglomerate and therefore post-dates the vent formation (and also post-dates all lava rock types found as inclusions in the agglomerate) but is earlier than the cone-sheets and dykes which cut this gabbro further inland. On the exposed quartz-gabbro rocks on the cliff top. glacial striae suggest an ice movement towards the west-north-west. Locality 4 [NM 497 711]. About 50 m along the coast, north­westwards from the northern gabbro/agglomerate contact, another contact is reached where a granophyre is intruded into the agglomerate. The contact is sharp and inclined southwards at a steep angle. Further inland a contact between granophyre and quartz-gabbro can be found at [NM 491 771] dipping to the south at 70°. and showing a chilled margin of granophyre against the quartz-gabbro. Thus the granophyre must represent the youngest of the three main intrusions examined on this trip and which are shown in North-South section. The granophyre is a typical non-porphyritic acid rock with alkali feldspar and quartz occurring in a micrographic structure. Locality 5 [NM 491 711]. If sufficient time is available follow the coast round to the west for about 500 m, until a black­weathering mass of ultrabasic rocks is found as a "screen" about 40 m wide. This black igneous rock is an olivine­gabbro which is locally peridotitic in composition. It separates the acid granophyre to the east from another, more basic granophyre to the west. This second granophyric type is characterised by the presence of green-brown elongate crystals of hornblende in the hand specimen. Both types of granophyre are altered by the basic olivine-gabbro screen. Return to Faskadale along the cliff tops and observe Rhum, Muck, Eigg and Skye on a clear day. Sea birds such as shags, cormorants and gannets are commonly seen along this coast, and seals have been observed in the sea close to the shore in Faskadale Bay. This page was last modified on 14 December 2015, at 00:37.